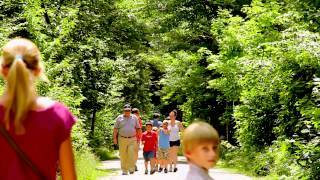 The Rogala Family presents a reality-based YouTube video blog featuring our family operated campground 'Mackinaw Mill Creek Camping' in Mackinaw City, Michigan. The Mackinaw Mill Creek Camping Show starts with a video tour of the campground and it's features and amenities. 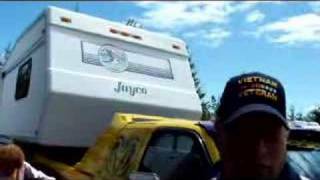 Then watch a video detailing the history of the campground and the Rogala family. 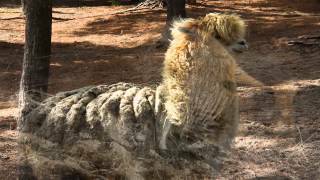 Additional videos feature the maintenance and operation of the campground as well as family life of the Rogala's. You can watch all the videos in order by using the viewer on this page. Or scroll down and click on the links below to see individual videos on YouTube. 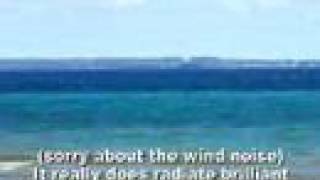 A playlist of all videos created and published by Mackinaw Mill Creek Camping. A detailed look at Mackinaw Mill Creek Camping and the amazing attractions that have made the Mackinac Area a leading tourist destination. 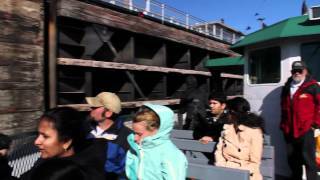 Includes the camp, Mackinaw City, Mackinac Island, Soo Ste Marie, Taquamenon Falls, Fort Michilimackinac, Mill Creek Discovery Park, Whitefish Point, the Coast Guard Icebreaker Mackinaw Maritime Museum and The Garlyn Zoo. In 1963 a young couple took a 10,000 mile trip with three small boys across the US and Canada to learn everything they could about camping and to search for the perfect location for their own campground. This is the true story of Richard and Rose Rogala and one of Michigan's largest and most popular family owned and operated campgrounds. 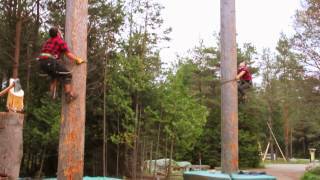 In this episode we follow Chris Rogala as he demonstrates the transplanting of trees at Mackinaw Mill Creek Camping. Frank interviews his brother Chris about how the campground saves many of their large hardwood trees by transplanting them. Chris discusses the threat of the Emerald Ash Borer to Northern Michgan Ash trees. He explains what steps the campground is taking to recover from potential infestation by the Emerald Ash Borer. The campground asks that campers abide by Michigan law by not transporting or bringing firewood into the campground from outside sources. (Produced & Directed by Frank Rogala). The pristine Straits of Mackinac from the shores of Mackinaw Mill Creek Camping (mostly in the early spring) will, from a trick of the light, exhibit a beautiful and glowing azure blue. 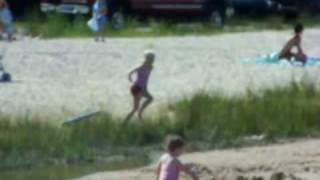 This is an undoctored video shot with an old camera that documents this phenomenon. This is probably due to the changing position of the sun and the angle from the campground's shore. Sunny afternoons are your best chance for catching this beautiful sight from the natural beaches of the campground. Meet Chris Rogala's wife, Jolene Rogala, his daughter, Mindy and her pets that include donkeys, geese, the family's horse (Doc) and Sarah's chocolate lab pupply (Izzy), and see a lot of poop! Jolene, Chris and Frank Rogala and various camp staff bust their butts working to renovate and get The Park Store open for business by Memorial Day 2008. Everyone is nervous but excited. Meet many of the camp staff for the first time and see them in action. Frank Rogala explains how he has started the Mackinaw Mill Creek Camping Folding At Home Team to help Stanford Univeristy fold proteins with spare computer time - to help cure Cancer, Alzheimers and Parkinsons. You can join too! TEAM ID 67265. Our team is currently 2251st place out of 134,741! Not bad!!! Go campers!!! Our guests with large RVs save hundreds of dollars on gas by leaving their campers in our Dollar per Day storage area (year-round) while they enjoy the many attractions in the Mackinac area. They can travel to and from the camp without driving or towing a large RV and the large the camping unit - the more the savings! Host Frank Rogala sets off with a 12-foot ladder and a camera on a beautiful June afternoon to get some fresh angles of the campground and encounters sun, rain, a hay ride, the playground, a rainbow and more! 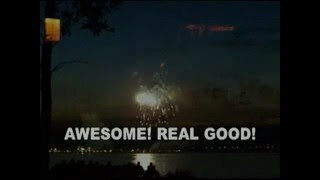 Fireworks, campers enjoying Mackinaw Mill Creek Camping, through camper interviews after the grand finale we find out how the weekend went... and our first episode dedication. Hosted by Frank Rogala. Host Frank Rogala takes you on a tour of one of Mackinaw City's secret local favorite late night dining locations. Witness a french toast eating contest and see how to find the actual location of Lenny's Bridgeview Diner (open 24 hours). Located in Michigan's favorite tourist destination Mackinaw City, the bridgeview diner is rowdy, friendly and has great diner food for breakfast, lunch and dinner. The 1950's atmosphere and BIG personality are care of Lenny Noyes, owner operator and known as "Chief" by all who enter. 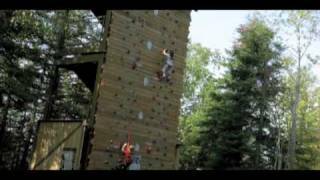 A guided tour of Mackinaw Mill Creek Discovery Park in Mackinaw City, MI and its zip line, climbing wall, and forest canopy walk by three children. Lizzie, Erin, and Nick Rogala give their perspective on Mackinac State Historic Park's newest attraction. 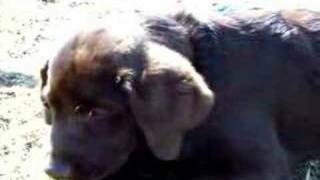 Video by Frank Rogala. Photos by Vince Rogala and Edward Rogala. Music by Robin Canada. 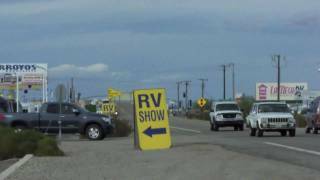 Mackinaw Mill Creek Camping visits the RV Show in Quartzite. Manning a booth to hand out literature and tell people about our campground/cabin/golf resort in Mackinaw City, MI. Torrential rains hit and close the show for for the first time anyone can remember. We give away prizes to winners in our drawing. Hosted by Frank Rogala. 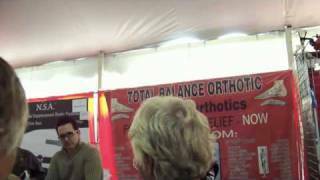 A time capsule walk through of the event tent at the 2010 Quartzite RV show. Pause the video if you need a closer look as the camera moves fairly fast so that it can cover the entire floor within the allotted 10 minutes. Also a brief look at the beads and minerals available by one of the Quartzite vendors outside the show. 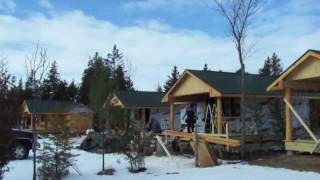 Our new 4-person cabins with bathrooms were completed in 2010. 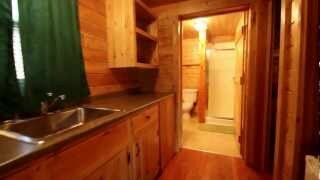 It is a cabin for up to 4 persons with a bathroom. 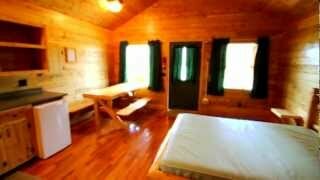 Most of our cabins are for up to 6 people. Callers have been asking for photos of these new cabins, as you see the floorplans vary. 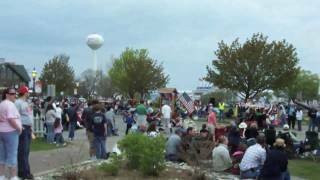 Mackinaw City has the largest Memorial Day parade in the State of Michigan. Featuring marching bands, floats, clowns, the cast of the Pageant at Fort Michilimackinac, antique cars and trucks, shriners, and more. 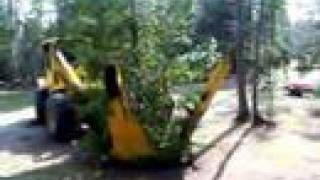 See the Mackinaw Mill Creek Camping antique Trucks and Tractor. Created by Frank Rogala. An unexpected tradition arose from a string of lights tossed on a bush outside an RV nearly 20 years ago. 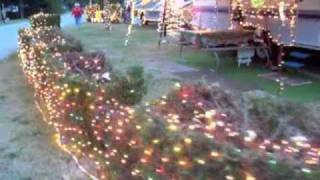 Now campers coming to Mackinaw Mill Creek Camping during the last two weeks of July are treated with Christmas lights, bells and treats provided by campers who do it just because it is fun. Chihuahua/Poodle (Chipoo) Charlie takes a test ride on an inflatable sled (meant for toddlers) in the bay at the campground with Frank Rogala. 9&10 News (WWTV) conducted a poll on their viewers' favorite place to go camping for their news segment "MiFavoriteThings." Mackinaw Mill Creek Camping was chosen as one of the top rated campgrounds in northern Michigan and featured during this news segment. 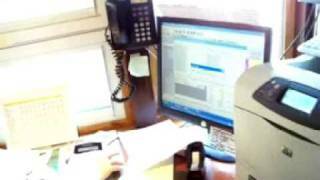 Vince Rogala of Mackinaw Mill Creek Camping is interviewed and talks a little about the park and it's history. Frank Rogala of Mackinaw Mill Creek Camping introduces the Mackinaw City Multi-Sport Mix where over 300 athletes come to run, swim and bike through the great northern wilderness. 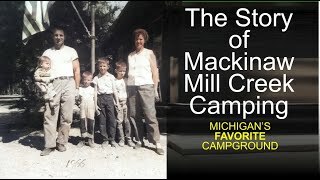 Two very special participants, known as "Team Maddy" were guests at Mackinaw Mill Creek Camping and Rick Van Beek personally tells the inspiring story of how he came to the realization that his daughter Madison, born with severe cerebral palsy, loved participating in athletic evens. The Rogala family celebrated their 50th Anniversary of building and operating Mackinaw Mill Creek Camping. The 50th Anniversary celebration included a parade, marching band, antique and one of a kind vehicles, horses, wood carving demonstrations, a Jack Pine Lumberjack Show, musical performances, food and refreshments and more! All of this, on the shores of the Straits of Mackinac with a view of the Mackinac Bridge and Mackinac Island. Thanks to everyone who helped us celebrate! 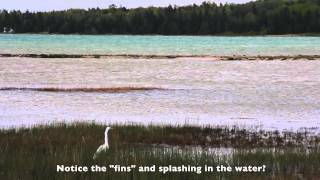 Late May and the water levels in Lake Huron have finally returned to normal. We discover fish spawning, for the first time in years in our bay. 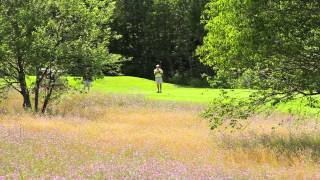 Get a glimpse of The Mackinaw Club, 18-hole golf course located near Mackinaw City and Paradise Lake. 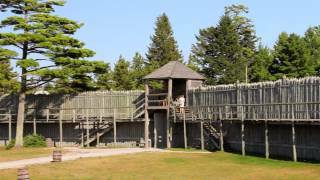 Travel back to colonial times as you experience a guided tour of the National Historic Site Fort Michilimackinac located in Mackinaw City, MI. 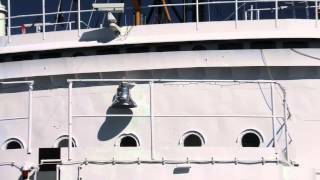 Video tour featuring the U.S. Coast Guard's museum icebreaker ship, ICEBREAKER MACKINAW WAGB-83, known as the "Queen of the Great Lakes," located in Mackinaw City, MI. See what makes this vessel so remarkable and such a valuable part of American history. 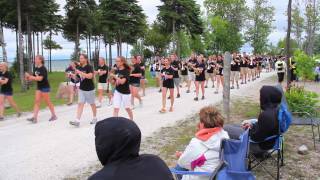 A video glimpse of the entertaining Jack Pine Lumberjack Show located in Mackinaw City, MI. Experience skills of the lumberjacks like axe throwing, pole climbing, chainsaw carving and more! 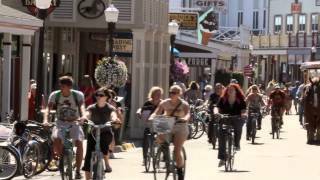 Experience the incredible attractions at one of Michigan's top tourist destinations, Mackinac Island. Where no motor vehicles are allowed and horses and bicycles are the main form of transportation. 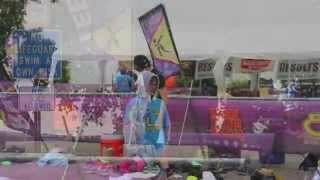 Just a quick video of the foggy morning of the 2014 Multi Sport Mix held in Mackinaw City the last weekend of July each year. See the historic McGulpin Lighthouse and the surrounding grounds in this video tour. See the many attractions at Historic Mill Creek Discovery Park including costumed staff, historical demonstrations, an exciting climbing wall, zip line and forest canopy bridge. Take a video tour of the Soo Locks located in Sault Ste Marie, MI and learn how the 1000-foot ocean freighters are lowered and raised in the locks to navigate between Lake Superior and Lake Huron. Take a video tour of the 2nd largest waterfall this side of the Mississippi River. Learn how the water gets its rich amber color and the many attractions and amenities at this destination. 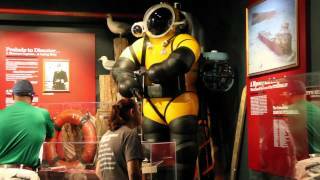 A video tour of Whitefish Point, including the Great Lakes Shipwreck Museum, Whitefish Point Light Station, Whitefish Point Bird Observatory and the Seney National Wildlife Refuse. Make sure to plan a visit to these unique freshwater sand dunes found only in Michigan. 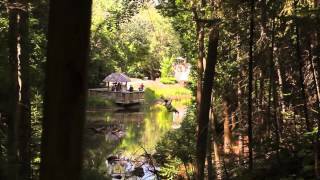 Examples of vacation cabin rentals at Mackinaw Mill Creek Camping, one of Michigan's leading tourist destinations. 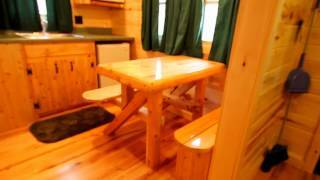 A brief tour of the various 4 person cabins available at Mackinaw Mill Creek Camping located in Mackinaw City, MI. 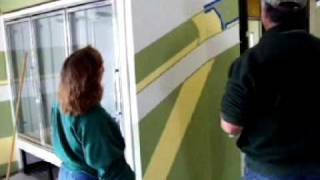 A brief tour of the floor plan for large cabins with bathrooms available at Mackinaw Mill Creek Camping located in Mackinaw City, MI. 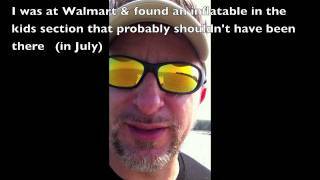 A brief video tour of the Park Store at Mackinaw Mill Creek Camping in Mackinaw City, MI. 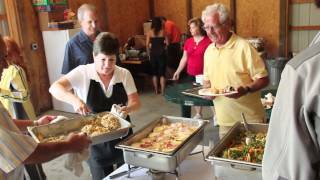 Take a video tour of the group and rally facilities at Mackinaw Mill Creek Camping in Mackinaw City, MI. 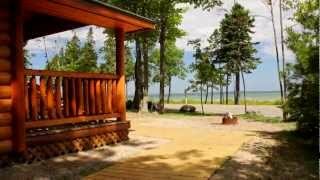 One of Michigan's largest and most popular family owned campgrounds with a mile of shoreline on the Straits of Mackinac. My family and I just spent a week at your campground, and all of us had a really great time! With the rising cost of fuel, we had to cut some of our plans. However, your campground, being so close to Mackinaw City made it seem like we didn't miss a thing! Even on the days when we didn't leave the park, everyone found something to do, whether it was the pool, the lake, the arcade or just sitting around the campsite. This is our second year of camping with you, and we are looking forward to staying with you again next year.